Your Reaction: What did you think of Woolf Works live in cinemas? Audience reactions to Wayne McGregor's Virginia Woolf-inspired ballet, relayed live to cinemas around the world. 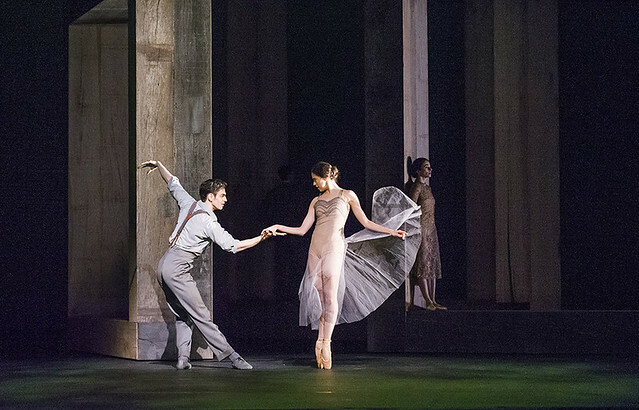 #ROHwoolf most beautiful and complex art I have seen for a long time. Max Richter score beyond words. Raw emotion laid bare by Alessandra Ferri tonight #ROHwoolf Stunning! #ROHwoolf Simply spectacular. A moment in life when it all makes sense. What talent, God given. Feeling privileged. 'Tuesday' ends with a heartbreak that's somehow also an affirmation. Thank you #ROHwoolf. I don't think there's a dry eye in the house. My first live into cinema broadcast #ROHwoolf - sublime and entrancing! What did you think of Woolf Works live in cinemas? The next Royal Opera House live cinema relay will be The Royal Ballet's Sleeping Beauty on 28 February 2017. Find your nearest cinema and sign up to our mailing list. Completely mesmerising music and movement. Modern dance at its best. Would have preferred the camera to zoom out for wider/ longer shots during Becomings: camera a bit too close up when there were shadow figures and so much else is going on all over the stage. Brilliant dancing and choreography. I even enjoyed the first ballet, even though it was marred for me by frequent picture break up, which The Palace Cinema, Malton tell me was not their fault. Why did this happen and can you put a stop to it in future, please? Thank you for getting in touch. The Palace Cinema contacted our technical help desk last night and they were given advice on how to fix the issue, as the problem was at their end. We will follow up with them and hopefully they'll have no problems for future screenings. Saw Woolfworks in a cinema in Berlin. Haven't seen anything like it. This ballet CANNOT BE DESCRIBED! The subtlety reduced me to tears; It is literally out of this world. No adjectives are adequate. The magic was well beyond this physical world. I don't think I can adequately describe how much I enjoyed that performance. This is definitely my favourite McGregor piece. I especially appreciate him using dancers from all the ranks and of all ages. All the performers tonight were outstanding, Calvin Richardson was great - he deserves a promotion. As was Matt Ball, Bonelli, Lamb, Hayward & Avis. I thought Stix-Brunel was fabulous throughout. And as always Ed Watson was amazing. But the show is Ferri's - she truly is an exceptional artist, I felt blessed to see her perform. She is miraculous. So well done Wayne for this ballet, for appreciating Alessandra and reminding us all how this prima ballerina can touch our hearts. What an extraordinary ballet! Emotional, stunning, life-changing experience. Thank you so much, #ROHwoolf for live streaming this masterpiece. All the best from Novi Sad, Serbia. Es la prinera vez que veo danza/opera en el cine. Me ha gustado. Volveré a repetir. Once is not enough to appreciate all the layers of this piece. A DVD would be wonderful. Anyone who thought Alesandra Ferri's performance was moving and powerful should take a look at an old DVD of her dancing Juliet with RB. (Including David Drew as Tybalt). Such a privilege to share in what must surely be one of the most exciting and moving artworks of this century . It perfectly captured the spirit of Wolf's works and her soul . Intricate and demanding choreography , extraordinary feats of dancing , sublime musical score , atmospheric sets and perfect lighting and costumes . The filming enabled us to have a close look at the dancers' work . An excellent blend of ensemble shots and close ups . Truly unforgettable ! Thank you to all involved . Well said! What a brilliantly written review. At last - a Wayne McGregor ballet that I can truly say was not boring! Magical and spellbinding! Wonderful dancing seen at close quarters - such energy, physicality and flowing movement - and brilliant music. Great performances all round, but Alessandra Ferri was outstanding! Next morning and my head is still whirling with that evocative Richter score and the mesmerising dance. Ferri magnificent. Wayne triumphs! Powerful, poignant,,innovative, mesmerising just a few words to describe Woolf Works. I watched this at Alnwick Playhouse in Northumberland and what an evening I had. All the cast were brilliant, Alessandra Ferri wonderful central performance so moving. Hopefully there will be a DVD. This second production of Woolf Works was even better than the first. A stunning performance that fits the cinema so well. Beatriz Stix-Brunell was especially outstanding. As the young Clarissa her dancing was exquisitely tender, a beautiful performance and the way she moved those long arms, I can't wait to see this mature and versatile dancer in the part of Odette/Odille she has the range to dance both parts excellently - last night she was so so elegant. I completely agree with you Hugh. Beatriz Stix-Brunel is a dancer who has, in my view, been slightly under the radar over the past few years. Perhaps it's because they realised she was yet to fully blossom? Well, she has now! Whenever she's on stage the eye is drawn to her again and again. Huge Congratulations to her for managing to shine amongst such a breathtakingly stellar cast. I wish her continued success, and look forward to seeing her in more challenging roles. Riveting production in every way. Challenging choreography enabled us to enjoy the superb virtuosity and range of the whole company! "I now, I then" was the best thing I've ever seen. Reqd. a pocketful of tissues. Like others here I would love to get a recording, to watch again, so as to understand it more. It was great. The whole thing was great. I find no words to capture my experience... See it for yourself. Brilliant response of one art form to another. Showed a deep understanding of Woolf and her work especially first and last ballets. Deeply moving especially the duet between Septimus and Evans captured all the complex loss of WW1. I was bowled over that Woolf could be revealed to me in such a different way. The dancers were astonishing. See my blog at wordsworth-editions.com or on wordsworth site on Facebook. Brilliant response of one art form to another. Showed a deep understanding of Woolf and her work especially first and last ballets. Deeply moving especially the duet between Septimus and Evans captured all the complex loss of WW1. I was bowled over that Woolf could be revealed to me in such a different way. The dancers were astonishing. See my blog review at wordsworth-editions.com or on wordsworth site on Facebook. The combination of McGregor's choreography on Richter's music score vibrantly embody the power of Woolf's works and the fragility of her humanity. A poignant and mesmerising story about imagination and beauty: Wayne's language and his way of connecting movement to music has a unique grammar: it perfectly tells what's going on. If I wonder about the evolution of dance in the future, McGregor's vision is the perfect answer. Stunning principals, amazing costumes and superb light design. Bravo!! I'm still reflecting on what I saw on Wednesday night. I have never been affected by dance this way before. Simply stunning. Orlando was the outstanding piece for me; the athleticism of every single one of that stellar cast was a sight to behold and I can't single out any the dancers except for the ' dream team' (in my eyes) of Avis, McRae and Watson who took my breath away. Ferri was made to dance this piece and McGregor showcased her talent perfectly. Bonelli was captivating in the final act too. Music, lighting,staging and costumes all collided together in the most outstanding piece of art I'm likely to see for a very long time. Congratulations to everyone involved. I watched this in The Tower in Helensburgh, a converted church, with a very small audience, and a huge screen. I haven't been so moved by any ballet, opera or concert, book or piece of music. This is magical, transcendental and laden with emotion. It's been said by other reviewers - this was perfection, on all counts. absolutely mesmerising from start to finish. I couldn't take my eyes off the screen. It was like drinking sweet golden nectar! It was such an amazing experience. I was so deeply touched, that i couldn't just hold back my tears almost all the time. Thank you all so much for this unforgettable evening ! Once is really not enough. It would be great, if i could have a DVD. Thank you for letting us know how much this performance moved you. I'm happy to tell you that there are plans to release a DVD of Woolf Works. We still don't have a date but please keep an eye on our website for announcements. Had to wait for the "Encore" showing of "Woolf Works", and would have gone to see it again if that had been possible, so very glad to read that it is being released on DVD. The way the scenery in "I then, I now" was choreographed rather than just moved around, seeming to interact with the dancers, recalled the Diana figure in "Machina" to mind. It is a great pity that the Titian Metamorphosis trilogy is not available as a DVD. Swept away by the dancing and the music. I am not often enthused by contemporary music but thought this was the perfect marriage of sound and movement. PS I hope to see and hear this work live at some time, I do hope you will bring it back in another season. There was so much action, I am still trying to absorb it all. I advised all my friends and so most of them managed to catch the encore and afterwards thanked me for the tip off. As always, the starting point is the musical score and this one is superb. After that everyone else made stunning contributions. I only missed the encore in order to digest the vast input and await the Blu-ray release before my better prepared repeat viewing. Viewers were really holding their breath and gripping the seats, it was easy to understand why. Of course there has to be a film release of this production since I don't think there has ever been anything quite like it. This was a 'white knuckle ride' of a production. I was one of those who hoped to see the encore of Woolf Works at the Piccadilly Vue cinema last Sunday. Owing to "technical problems" and the absence of a projectionist, we sat through 20 minutes of sound without pictures before being offered a refund. No one seemed to know or care what was happening. A less than ideal experience. I'm very sorry to hear that you experienced this cancellation. We have followed up with the cinema and hope that this situation won't happen again. congratulations Noelia for bringing such a fabulous work full of beautious attack,'sehnsucht' and heart to the cinema - bought the cd the next day, so weeks later head and heart still resounding. Please release the dvd as soon as possible! Mind blowing! Most important event in dance drama in past ten years. All three sections of this masterpiece have been shaping my dreams since I was privileged to see it. PLEASE RELEASE A DVD of Woolf Works! PLEASE! To be honest, whilst I am a recent convert to classical music, I had always dismissed ballet as being a bit too 'high brow' for my tastes. But, I stumbled across this performance on BBC4 last summer and was astounded by the music, the athleticism, the passion, skill, movement and energy of the performance, in particular Part Two. Beautiful, absolutely beautiful. The music the dance and the themes cast a spell which was only broken by the final note and step of the performance. Some ballet critics need to understand that dance is not just about ticking boxes.